My favorite thing about this birth story? A mom who proves that she is capable. I don' t know when we as women decided we couldn't give birth without drugs and neither should anybody else, but it isn't true. Good for her for proving that to the world. Jaxon’s Birth Story – In Time for the Fireworks on the Fourth of July! We kicked off July 4th with a 38 week check up with our midwife Denise. The appointment went well, except I found out that my GBS test had come back positive. Boo. We talked a lot about what my options were, and I decided to try a course of probiotics and retest the following week to see if I would test negative. The rest of the appointment went well, and I asked to be checked because I was curious if I'd progressed since last week - I was still at 2 cm, but I was 80% effaced and baby was very low. I was also measuring textbook normal - 38 cm for 38 weeks. I won't lie - I was a tiny bit disappointed that I hadn't progressed further, as I'd been having lots of Braxton Hicks and was thoroughly uncomfortable. I asked Denise if there was anything I could do to "encourage" baby to come. I'd already been drinking red raspberry leaf tea, and taking evening primrose capsules twice a day. Denise gave me an herbal solution containing cohosh and other herbs, and said I could try taking that a few times a day to see if it would help things along. I used the bathroom before leaving the appointment, and I noticed I was bleeding a little bit. Denise said it was likely from the cervical exam and nothing to worry about. We made our appointment for the following week and then headed out to pick up the aforementioned probiotics and to run some errands. I was moving pretty slow, as we were in the middle of an awful heat wave of 100 degree+ temperatures and high humidity. During our errands, I texted my mom and let her know how the appointment had went. Essentially I was in the same place as last week - things could start any day, or it could be a few weeks. While we were out and about, I noticed that I was still bleeding a bit. I knew this could still be from the exam, but I found it a bit odd since I hadn't bled at all the last time I'd been checked. We picked up the probiotics and a few things that I needed to purchase for work, and headed home. Once we got home, I noticed even more bleeding and I began to think that maybe this was the "bloody show". Around noon I decided to call Tavniah, my primary midwife (both Denise and Tavniah are my midwives, we alternate who we see at each appointment, but you have one midwife who's assigned as primary and she's your main contact for all labor related questions) and let her know. She said "Denise and I were just talking about you!" and told me they were thinking I wouldn't make it to my due date because I was so effaced. She said the bleeding could be a sign, but it could also be from the exam. Just in case, she recommended we take a nap and make sure to eat a good lunch and drink plenty of water. So we ate lunch, I took my first probiotic and a dose of the herbal solution and then laid down for a snooze. We woke up around 4, and lazed around in the air conditioning a bit more. The heat index was hovering around 110 degrees. Once I was awake and moving around, I noticed I was still bleeding, and I started having contractions that felt...a little bit different. They were stronger than the Braxton Hicks, and I could feel them a little in my back, but they didn't hurt. I noticed that these contractions seemed to have a start and an end which I had never noticed with Braxton Hicks. Out of curiosity I timed them from 4:30-5:30 pm - they were about 30 seconds long, and were coming about every 2-5 minutes. At this point, I called Tavniah again - she was excited for me and and said this was probably the beginning of labor. She said that I probably wouldn't have a fourth of July baby, but we might meet our little guy by the fifth! She recommended that I take a bath and relax to see if I could make the contractions go away, and that I eat dinner and make sure to keep drinking water. We started to get a little bit excited, but I knew it could be hours before anything happened and that this could still be a false alarm. My husband Nate was scheduled to work at 8 pm that night, so he called to update them, and said that maybe he wouldn't be coming in. I also texted my mom and told her to keep her phone on ... just in case. I tried to relax in the bathtub, Nate even had the idea of keeping a wet hand towel over my belly so it wouldn't get cold. :) The contractions kept coming while I was in the bath, so after a bit I gave up and got out. At this point the contractions started coming more frequently and they seemed to get stronger - I was pacing around the house, unable to sit or lay down - partially due to nerves and partially because I was uncomfortable. I'd always imagined that I would want to lay down during contractions - no. Laying down was the last thing I wanted to do. At 6:40 pm, I called my mom and told her that she should probably get in the car and start her 3 hour drive to my house. I still wasn't sure that this was real labor, but I figured we were better off safe than sorry. My mom was pretty shocked, and I can't blame her since it was only a few hours prior that I'd texted and said that nothing was happening! I told her that I apologized in advance if it turned out to be a false alarm. I attempted to eat some leftover pasta at this point - but I couldn't get much of it down. I was still bleeding a little bit, and soon my stomach got upset. I never threw up, but I was nauseous and did start having diarrhea - I knew this was another sign that things were getting started. At 6:55 I called Tavniah again to give her an update. She told me that she would come over whenever I wanted her to, and that it would take her a little over an hour to get there. I didn't think there was any hurry, so I told her I would call back when I thought things were really picking up. She recommended trying to time my contractions for an hour or so. Nate called into work around this time too, and started setting things up for the birth. Meanwhile I was on the bathroom floor, hunched over the birth ball. The contractions were starting to hurt. I timed them for awhile, and they were about a minute long and coming every couple minutes. I kept drinking water because I knew I needed to stay hydrated, and my system continued to clean itself out. Every time I would use the bathroom, I would have a hard contraction right afterwards. I started to dread every time I needed to go. I think the constant need to use the bathroom combined with those hard contractions that immediately followed was the hardest part. Things got intense pretty quickly. I could no longer even think straight to time the contractions - I had been using an app on my phone where you pushed "start" and then "stop" and the little "stop" button started to taunt me. I wanted the contraction to stop, but it just kept going. Kind of like when you're running on a treadmill, and the "stop" button is just SO tempting...except in this case you can't make things stop or slow down by pushing that button. I gave up on timing contractions. I was making moaning sounds during these hard contractions. During the really hard ones, Nate would come running into the bathroom to massage my back and make sure I was okay. Then he'd run back out to keep setting up the supplies. He asked if I wanted him to stay with me, but I told him he better keep setting things up (in hindsight this was a very good decision). Nate also asked me if I wanted to move into the bedroom or somewhere with a softer floor - but no, I wanted to stay right where I was on the bathroom floor. All of the books I'd read had emphasized the importance of relaxing and breathing during contractions, so I focused hard on doing both. I also kept focusing on the fact that with each contraction the baby was moving down, and that we would meet him soon. During contractions I was very focused, but during the minute or two I had between them I was quite coherent. I remember thinking that I couldn't believe I was hunched over our (rather dirty) bathroom floor, and I remember noticing that our toilet really needed to be cleaned. When you read birth stories, women always talk about being inside themselves, or going to "laborland" and zoning out. At some point, I know I tuned out, but at 7:35 I was present enough to tell Nate to call Tavniah and ask her to come. At some point I know Nate also spoke with Denise, and she headed over too. While he was on the phone with Denise I remember yelling for him to see if we could set up the tub (the midwives had been planning to set it up when they arrived). She told him to go for it, so he started setting it up. The contractions were still really intense, but I can honestly say that I was never scared or fearful of what was happening. Part of me was really excited, part of me couldn't believe that this was really happening even though I was only 38 weeks, and part of me was thinking how am I going to do this for hours yet? I figured I would be in labor for at least the rest of that night, if not longer. Nate was frantically setting up the tub - I think the noises I was making may have clued him in to the fact that this was happening pretty fast. Tavniah arrived around 8:30 and she was immediately reassuring. She massaged my back during the next few contractions and gave Nate more direction for filling the tub. I asked to be checked because I wanted to get in the tub, and I somehow stumbled into the the bedroom so she could check me on our bed. While she was putting gloves on I started having a contraction and I had to get on my hands and knees on the floor - there was no way I could be laying in bed. I cannot believe that people labor that way for hours. I was expecting to be dilated to 5, maybe 6 cm - mostly I just wanted to be able to get in the tub. Even Tavniah seemed a little surprised when she said told me that I was 9 cm, nearly complete! She also said she could feel the bag of water bulging, and she had me feel it. It felt like rubber - almost like a bouncy ball. I was so happy to hear that I was that far along. At that point I realized that I had gone through transition in the bathroom without knowing it, and was really excited to get in the tub. I had been dressed up until this point, but I promptly stripped. My sense of modestly went right out the window. Tavniah told me that I was going to have a fourth of July baby after all, and said that she hoped Denise would make it in time! The tub was only partially full but I pretty much jumped in, and my god, it was amazing. Nate called my mom to see where she was - unfortunately she was still quite a ways away. He told her I was 9 cm and I remember telling him to tell her to drive safe! I was excited and happy to be so far already, and being in the tub was wonderful, so I was in very good spirits at this point. Nate was still finishing filling the tub - luckily our hot water heater was large enough that we didn't need to boil additional water - we wouldn't have had time! Tavniah was monitoring the baby's heart beat, and told me that he sounded great. She also kept massaging my back during contractions which was relaxing. The contractions felt a million times better in the water, but they were still intense and I know I still made quite a bit of noise during the peak of each one. I remember commenting about how great the water felt, and Tavniah laughing and saying every pregnant woman ever loved the water. I was on my knees leaning against the side of the tub at the point. Someone brought me juice, and I kept sipping water too. At some point Denise arrived, and Nate was able to finish filling the tub, and it was perfect timing. My water broke after just a few contractions - I felt slight pressure and then a pop. Almost immediately afterwards, I could feel my body start pushing. I remember announcing both of these things - saying "my water just broke" and "I think I'm pushing". Tavniah suggested that I try sitting more upright, with my back against the side of the pool, to see if it was more comfortable - it was, so I stayed this way until the end. After my water broke, Tavniah told me to reach down and feel my baby's head. At first I didn't think I could feel it, but she told me that yes, I could and I should try again. His head was hard, but it didn't feel smooth like I expected - I think I was feeling the ridges where the bones in his head were moulding. I have to say - the human body is incredible. My body knew exactly when to push, and I am not sure I could have stopped it from doing so if I tried. I made a LOT of noise during these contractions. I squeezed the sh!t out of Nate's hand, and Tavniah rubbed my thighs and told me to relax and to breathe the baby down. I found her presence very reassuring throughout labor, and tried hard to focus on breathing and relaxing. Between contractions it was pretty quiet and I was still pretty coherent. 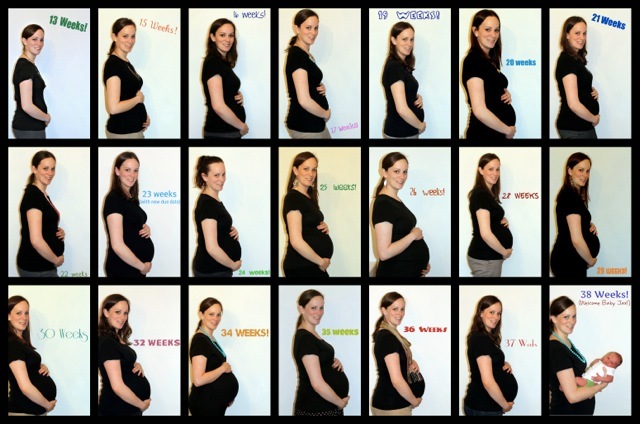 I remember asking "How many more contractions do you think it will take?" and someone told me probably not many! I also remember saying "c'mon baby" and "owowowow" during contractions. I feel like I was very present during the entire birth, but at the same time I was in my own world. I remember every sensation and I know I was feeling excited, but I can't remember what else was going on in the room. I do remember at some point Nate smiling and saying that he could see the baby's head. I could feel his head moving down, and at one point I know I said "it burns!" and I knew that I was feeling the "ring of fire" that everyone talks about, and that he was crowning. Tavniah reminded me to try and pant and allow him to slowly stretch me so I wouldn't tear. With my hands I could feel how close his head was to emerging, and in another contraction or two I was able to bear down, and I felt his head pop out. This was a surreal feeling. I could feel his little head and face and ohmygosh the hardest part was over. Tavniah said I just needed to wait until the next contraction and I'd have a baby! The next contraction I pushed and his shoulders and body slid out. I caught him and brought him up to my chest and said "oh my god we have a baby" about 100 times. His official time of birth was 9:32 pm - in time for the fireworks! We checked to see if he was a boy and we snuggled him. I can't remember if I cried or smiled or if Nate did - we were too busy just staring at him. He fussed a little bit, his bottom lip quivered and he was just perfect. We announced his name - Jaxon Frank (Last Name) and I remember saying, "he's not even that big!" (people had been telling me for months that I was going to have a big baby). At some point I also said, "that wasn't that bad!". This entire process from when I got into the tub to when Jax was born was only 30 or 40 minutes. I pushed for maybe 15 or 20 minutes. I'd really only been "in labor" for about 5 hours total. It all happened fast. After a few minutes of loving on Jax, Tavniah had me bear down to deliver the placenta which was a piece of cake after having pushed out a baby. Once the placenta was delivered, they clamped the cord and Nate cut it. Tavniah helped me up out of the tub and into bed, and we snuggled him - he wasn't taken out of my arms once. At that point, we just cuddled the baby and they checked us both over. Denise told me his Apgar scores had been a 9 at birth, and a 10 at five minutes. They checked his lungs and heart beat - he was perfect! He did have one tiny little broken blood vessel in his right eye from his trip through the birth canal (sorry baby!). Tavniah and Denise then checked me over. I was pretty shocked to hear that I hadn't torn my perineum at all - considering Jax's very fast arrival, I'd almost expected to tear. I had one small tissue tear that didn't even require stitches, and I honestly could have cared less at that point. They also weighed and measured our little guy - he was 9 pounds, 8 ounces and 21.5 inches long. My mom arrived at some point during my exam and got to meet her new grandbaby. I'm know I’m very fortunate to have a husband who was so supportive, a state that allows midwives to practice home birth and to have two great midwives located nearby. And I am so glad that we bucked the norm, and ditched the hospital. Thinking about it now, if we'd been in a hospital, things would've been drastically different. I know I would've been hooked to an IV because my of my GBS result. I also know that I would've had residual fears about who my care provider would be, if a birth tub was even available, and whether or not my provider and the nurses would support my choices. I would've needed to sign waivers to decline Vitamin K, eye prophylaxis, antibiotics, constant fetal monitoring and more. Quite frankly, I'm also not sure we would've made it to the hospital in time! When I said "that wasn't that bad!" immediately after the birth, I truly meant it. Parts of birth did hurt, and it wasn't exactly fun, but it was empowering and miraculous and actually pretty awesome. I have so much respect for my body and what it's capable of and I'm so glad that I was able to listen to my own body and just let it do its thing. It goes without saying that every single pregnancy related discomfort was totally worth it now that we have this beautiful baby boy. But I also think that every hour that I spent researching birth options, every time I left a hospital prenatal appointment crying or stressed out, every hour we spent driving to see our midwives, every time someone questioned our choice to have a home birth or doubted my ability to have a drug-free birth was also worth it - because I wouldn't change a thing about this story. Beautiful story. Sounds like you will be home birthing from now on, if your labours get any shorter with future children! !